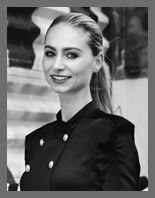 Joan Bruggink is the In-house Marketing Coordinator and Sales Consultant with The Dora Puig Team at Luxe Living Realty, the premier boutique real estate brokerage in Miami’s famed South Beach. Extremely tech-savvy and in tune with the latest integrated marketing trends, Bruggink is responsible for digital marketing and advertising for the Team, representing over $300 Million in sales per year, including managing the content for 8 influential social media platforms, email marketing, SEO and online display network, online listing and team branding advertising, as well as masterful and cutting-edge video marketing and she directs all print marketing. The multi-talented Bruggink also serves as the team’s graphic designer, handling the production of all disseminated content, creating and editing video’s and virtual tours, as well as managing all of the tech for Luxe Living Realty’s Lincoln Road and the South of Fifth Property Lounges. Originally from the Netherlands, and now with over 5 years of experience in the dynamic South Florida luxury real estate market, Joan Bruggink is both an innovative marketer and licensed real estate agent who is taking her talents and international experience to the top-ranked Dora Puig Team at Luxe Living Realty where she works directly alongside Dora Puig, Miami-Dade's No. 6 ranked broker in the country and No. 1 ranked broker in Florida and Miami-Dade County ranked by the Wall Street Journal. Along with her European background, keen eye for design and style, extensive travel experience and first class education, Joan's appreciation for various cultures and architecture have coalesced in in a stellar career for her in Miami. Prior to joining Luxe Living Realty, the multilingual Bruggink worked for a tech-forward boutique real estate brokerage based in Miami Beach where her lead-generating skills and penchant for first-class customer service led to more than $50 million in completed luxury residential transactions. While there, her team received the Miami Chamber of Commerce's “ Most innovative marketing for a real estate agent” award in 2014. In addition to being an agent, Bruggink has provided luxury concierge services and property management for the majority of her clients as well. Bruggink also has previous experience working for a real estate developer in South America. Fluent in English, Dutch and German, she is also currently learning Spanish and French. Bruggink Graduated with a BBA in Management, Economics and Law with a concentration in Real Estate Management from the University of Amsterdam.